Yesterday Mother Church celebrated the Feast of the Archangels Saints Michael, Gabriel and Raphael. Thursday she will celebrate the Memorial of the Guardian Angels. We might call this "Angel Week." In light of this, I'll try to do a few posts this week on the angels. War broke out in heaven; Michael and his angels battled against the dragon. The dragon and its angels fought back, but they did not prevail and there was no longer any place for them in heaven. The huge dragon, the ancient serpent, who is called the Devil and Satan, who deceived the whole world, was thrown down to earth, and its angels were thrown down with it (Revelation 12:7-9). The name of this dragon, of the Devil, of Satan, is Lucifer, a name meaning "Light-Bearer." The Archangel Michael - who's name means "Who is like God?" - led the host of heaven in battle against Lucifer. How did Michael fight Lucifer? I like to think that Michael confronted Lucifer with the power of his own name. After Lucifer and his angels rebelled, Michael asked, "Who is like God?" and Lucifer answered, "I am." Michael shouted with great power and force, "No, you are not!" and cast the Light-Bearer out of heaven. Is this not what Lucifer always does? In refusing to serve God and to obey the Lord Lucifer posits himself as God. Is this not precisely what he did in the Garden of Eden? He said to Eve, "You will not die. For God knows that when you eat of it your eyes will be opened, and you will be like God" (Genesis 3:5). Saint Michael comes to each of us, asking the question, "Who is like God?" We would do well to answer, "Not I." Walking through the breeze way that connects the rectory and the church this morning after setting up for the Mass, I realized my key ring had fewer keys on it than it normally does and should. Examining the keys remaining I found I was missing the master key to the high school and the key to the shed by the high school track. Naturally, I went into a panic wondering my keys could possibly be. After rummaging through my coat pockets and checking thoroughly throughout my suite I remembered that I was in the high school last night letting one of the soccer players retrieve a book. Then I panicked even more; I lost the high school master at the high school! After Mass I was to teach an early bird class for the Pastor who couldn't be there this morning. I searched the parking lot, looked in the doors I opened last night, and walked the same paths, all without finding anything. No keys were turned in to the secretary and the janitor found no keys either. And students were already in the building. This was not a good way to start the day. After class I walked back to the parish center and as I walking down the drive to enter it I realized I hadn't yet spoken with Saint Anthony about this situation (I know; I should have thought of that first, but didn't). Walking toward the building I prayed: "Tony, Tony, look around. Something's lost and must be found." I then added, "Blessed Anthony, please find my keys for me before they fall into bad hands." I approached the door leading into the parish center, checking the cracks in the pavement as I did so; I'd already checked this area no fewer than three separate times. As I turned ever so gently to my left something shiny very near my left foot caught my eye: my keys! And I assure you they were not there a moment before. After a three month hiatus the Priests Personnel Board meets again tomorrow in the "war room" in See City. One of these days I really will bring to the meeting a map of the Diocese will little churches, and priests to move around. From the war room, I will make my way to Raymond, Illinois where I will meet the Bulldog soccer team for a match. It was another hot day in Manteno yesterday and I received a bit of a sun burn again; you'd think I'd learn to start bringing sun block! I'll try to do a little post in the morning on the Archangels - whose Feast we'll celebrate - but aside from that don't look for too much from me as I'll be away most of the day. Today we pray with the Psalmist, “Remember your mercies, O Lord” (Psalm 25:6). We beg the Lord to remember his mercy toward us because we are all too often like that second son of whom Jesus speaks (cf. Matthew 21:30). He said that he would carry out the wishes of his father, but he did not. We hear the voice of Jesus every day, urging us and telling us how to be faithful to him. Each day of our lives he says to us, “go out and work in the vineyard today” (Matthew 21:29). Sometimes we do the work of the Lord, and other times we do not. What is this work that the Lord asks us to perform? What does it mean to labor in his vineyard? It means, first of all, that we must turn from our wickedness and do what is just and right (cf. Ezekiel 18:27). Having done so, we will have in us “the same attitude that is also in Christ Jesus” (Philippians 2:6). But some will surely say, “I have not done anything wicked; I am basically a good person.” The second part may well be true, but not the first. Each of us has committed – and even still commits – wicked deeds, for whenever we fail to carry out the Lord’s work in his vineyard that he has given us to do we turn to wicked deeds. Whenever we fail to love we surely do not do good deeds, but wicked. The Apostle Paul says to us today, “complete my joy by being of the same mind, with the same love, united in heart, thinking one thing” (Philippians 2:2). The one thing of which Saint Paul begs us to think is Jesus Christ. It is Christ himself that we are to imitate and follow, for “he shows sinners the way” (Psalm 25:8); it is he who shows us what is just and right. We know that by virtue of our Baptism we have become one with Christ, members of his Body, the Church, and we are therefore united with each other and with every member of the baptized. This is why the Apostle says to us, “Do nothing out of selfishness or out of vainglory; rather, humbly regard others as more important than yourselves; each looking out not for his own interests, but also for those of others” (Philippians 2:3-4). But how are we to do this? How are we to have in us that same attitude that is in Christ? It is only by listening to him and by being obedient to Christ Jesus – as he was obedient to the Father – that our work in the vineyard will bear fruit. It comes down to a question of obedience. Will we listen to the voice of Christ, the Good Shepherd (cf. John 10:27), who “guides the humble to justice and teaches the humble his way” (Psalm 25:9)? Or will we be like that second son, who “turns away from virtue to commit iniquity, and dies” (Ezekiel 18:26)? Will we be a faithful son or no? The choice is ours; we need only “listen to him” (Matthew 17:5). How then are we to grow in virtue and grow ever more obedient to Christ so that we will live and not die? We need look no further than where we are, here, at the altar of the Lord, gathered as we are for the celebration of the Holy Mass. Yes, how indeed shall we repay the Lord? We must first consider again how it is that the Lord has shown his goodness to us. emptied himself, taking the form of a slave, coming in human likeness; and found human in appearance, he humbled himself, becoming obedient to the point of death, death on a cross (Philippians 2:7-8). Here at this altar the Lord Jesus continually empties himself for us as he gives himself to us in the Eucharist. He humbles himself for us and makes himself present under the appearance of bread and wine. His goodness toward us is shown in his giving of himself for us. Here at this altar the death of Jesus Christ is re-presented to the Father and we who have been baptized into his death and resurrection are invited to partake of his Body and Blood, Soul and Divinity, all because Christ Jesus continually humbles himself and comes to us. It is here that we learn the attitude that is in Christ, the attitude of humble and faithful love that gives itself completely and entirely for the other. It is this same attitude that you and I must have in us. In the presence of such great love, how can we not listen to Christ Jesus? How can refuse to carry out his will for us? Looking upon the Crucified Lord do we not know that we must give ourselves to him as he has given himself to us? Yes, let us love the Lord Jesus by taking upon ourselves the same attitude that is his so that we might love our neighbor as well. To do so we must humble ourselves and listen to the Lord, trusting that he knows what is best for us. It may at first seem to us that the work he asks us to do in his vineyard is toilsome, but if we place our hand to the plow he sets before us we will find his work brings great delight and satisfaction. Indeed, he knows well what will satisfy the deepest aspirations of our hearts and it is this that he sets before us. To carry out the work of the Lord is to find our peace and to belong to Christ. Let each of us then be like that son who carried out his father’s will. It is true that at first he said, “No,” to his father, but it is also true that the Lord shows we sinners the way. The son’s love for his father kept tugging at his heart and he humbled himself, he set aside his own desires and set to work, in the end obeying his father. We, too, must let our love for the Lord direct every aspect of our lives that we might work well in his vineyard and, with his grace, bring about a rich harvest and live. Amen. For two months, June and July, we have the sun directly over our heads; still the heat is not so great as I thought. The climate is delightful, so that strangers easily become accustomed to it, and generally enjoy better health here than in their own country. The soccer team today will play matches in Manteno, Illinois, a city some two hours and forty-five minutes from Effingham. Thanks to the great generosity of our retired priest - who will "cover" my anticipated Sunday Mass this evening - I will be going with the boys. I cannot thank Fr. Carl enough for his great generosity. Whenever I call asking for assistance he never hesitates to agree, and then he checks his calendar. I don't know what I would do without him! If I ever get to retire I only hope to be half as generous as him! Tomorrow's homily is nearly finished, but needs just a bit of tidying up before posting; look for it later tonight. To obtain this happiness ... let us begin from this very day to prepare for a happy death. Let us not lose a moment of the little time we have still to live; let us walk on in th way of holiness and justice, persuaded that at that moment we too shall have the happiness of hearing those consoling words: "Come, ye good and faithful servants, who have been faithful in small things, to take possession of the kingdom I have prepared for you. Please keep the boys in your prayers today; it's going to be a long day. The American Papist reports Senator Barack Obama's full support of the Freedom of Choic Act. Do read it. Over at Unam Sanctam, Andrew's back at it with another apologietic post, this time on the Church herself. It seems to be the latest trend - or craze - for ecclesial communities to have coffee shops or bars somehow attached to their churches. While there may be merit to these, they also pose serious questions. Over at Vinum Novum, Bethany writes that as she and her husband have recently moved they have also received another "welcome to our city" type packet, complete with a coupon for a free coffee at an area church (at least, given the title of her post I presume it is). After receiving our “coupon” I couldn’t help but laugh, albeit a bit nervously. This lure gesture of good will is exactly what made me feel uneasy while passing the church. It reflects a consumer model of religion — a true relationship with Christ reduced down to a marketing ploy for the trendiest group or club in town. “He who has the most toys at the end wins,” only in this case it’s the “church” who has the largest crowd wins. This model lacks a sense of sacredness, history, truth, Tradition. An authentic Christian community should come together in communion to acknowledge and rejoice in their beliefs as truth, i.e. their faith. 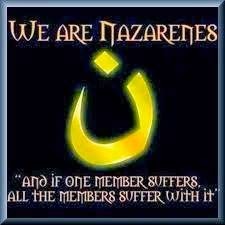 They gain strength in their faith from knowing that those around them hold those same beliefs true. Instead of strengthening the faith of its community of believers, the consumer model mocks faith, commercializing beliefs to be sold for whatever the spectators will pay for it. This is what Pope Benedict XVI calls "pandering" to people. What perhaps strikes me most is that there is no real mention of Jesus, no invitation to grow in faith, just an offer for a free gift. It could be coffee, a note pad, a magnet, a pen, a book, you name it. Which is better: drawing people to the Church with coffee or with Truth? I'll take Truth any day. Holy Mother Church celebrates today the optional memorial of Saints Cosmas and Damian, two of my favorite Saints if no other reason than the story of their martyrdom. These two brothers lived in Syria in the second half of the third century and were both physicians. In Cyrrhus, Syria, the brothers received the grace of martyrdom around the year 300. With three other brothers – Antimas, Leontius and Euprepius – Cosmas and Damian were born to their pious mother, Theodoche in Egea, a city in Arabia. We are told that the brothers promised each other never to accept money in exchange for their medical care. One day Saint Damian healed a woman by the name of Palladia, who begged the holy doctor to accept her gift in the name of the Lord. Desiring to honor her request and the name of the Lord, Damian accepted her gift. When Cosmas learned of this he was furious and instructed that, upon his death, he was not to be buried with Damian. Later that night the Lord appeared to Cosmas in a dream and explained the situation, thereby satisfying him, but not soon enough, for word of the brothers reached the ears of above-mentioned Lisias. 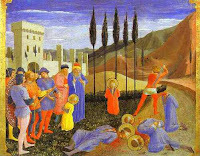 When the five brothers unanimously refused to sacrifice, Lisias commanded that they be tortured in their hands and feet. They made light of these torments, and he ordered them to be bound with chains and thrown into the sea, but at once they were drawn out by an angel and set before the judge. This official gave thought to the matter and said: “By the great gods, it is by sorcery that you conquer, because you mock at torments and calm the sea! Therefore teach me your magic arts, and in the name of the god Adrian I will follow you.” No sooner had he said this than two demons appeared and struck him in the face with great force, and he cried out, “I beg you, good men, to pray for me to your God!” They prayed, and the demons disappeared. The judge said: “You see how angry the gods are with me because I thought of leaving them. Now therefore I will not suffer you to blaspheme my gods!” He ordered them to be thrown into a huge fire, but the flame not only left the martyrs unharmed, but leapt out and slew many bystanders. The brothers were then stretched on the rack, but their guardian angel kept them uninjured, and the torturers, tired of beating them, returned to the judge. He in turn had three of the brothers put back in prison, but ordered Cosmas and Damian to be crucified and stoned by a crowd. The stones were turned back upon the throwers and wounded a great number. The judge, now beside himself with rage, had the three brothers brought out and ranged around the cross, while four soldiers shot arrows at Cosmas and Damian, still crucified; but the arrows turned and struck many, while the holy martyrs remained untouched. The judge, defeated at every turn, was at death’s door from frustration and had the five brothers beheaded in the morning. The Christians, remembering what Saint Cosmas had said about not burying him with Damian, wondered how the martyrs wanted to be buried, when suddenly a camel appeared on the scene, spoke in a human voice, and ordered the saints to be entombed in one place. They suffered under Diocletian, who began to reign about a.d. 287. Together Cosmas and Damian are the patrons of physicians, surgeons, druggists, barbers, the blind and, curiously, confectioners. As a side note, the young Joseph de Vuester chose the name Damien in honor of Saint Damian. to always live confidently in Your Merciful Love. Thank you, Sacred Heart of Jesus, Immaculate Heart of Mary, and Blessed Damien, for favors received. Each soccer season the team orders t-shirts and/or hoodies. Last year's hoodie is the most comfortable sweatshirt I own. And it, being of a blue tie dye variety, caught a few eyes at last week's clergy convocation. I'm glad I brought it, though, because it was chilly in the conference room. It was drawn this year by Matt Willenborg, one of our former soccer team members. I rather like it. I hope the hoodies this year will be as comfortable as last year's. A prayer service will be held at 1:30 p.m. in the lobby of Sacred Heart Grade School, led by Pastor Richard Eident of Windsor Christian Church. Following the prayer service, the Life Chain will be held from 2:00 p.m. until 3:00 p.m. This prayerful, peaceful and perfectly legal event will a Christian witness against the killing of unborn children. Signs will be provided. Donations of cookies will, of course, be much appreciated. If you able to attend, please do so. (I will be away in Quincy that weekend on a Great River TEC retreat). Out on the soccer field I have often found myself doing things that I never quite saw myself doing. To be honest, being out on the soccer field is itself one of those things I never foresaw, but when the boys asked how could I refuse? Today I found myself doing yet another thing I never imagined I would do. I've often said to the boys - as I've also said on this blog - that you can stop a priest at any time and ask him to hear your confession. He can only refuse to do so for a just cause. Today, one of the boys took me up on this (I share this with his permission). Standing there on the sidelines in the middle of soccer practice I found myself talking with one of the boys about sins that I thought were hypothetical; apparently they weren't. He asked to be forgiven for them and I remarked that we were not in confession. When he asked what to do to enter confession, we stepped back a few feet out of earshot and I heard his confession and absolved his sins right there on the sidelines. It was truly a graced encounter. Afterwards he said, "I feel like a huge burden has been lifted from my shoulders." "That's because one has," I said. Of all of the activities of the day, this was the highlight, the two celebrations of the Holy Mass excepted. Saint Paul famously said that he sought to become "all things to all men to save at least some" (I Corinthians 9:22). May we priests of Jesus Christ seek to become the same! And may the Holy Spirit guide us to meet people where they are, so as to bring to them the tender mercy of God in every place and at any time. And may more people seek out their priests, imploring from the mercies of God, wherever they may be. The Psalm refrain at this morning’s Mass, “Your word, O Lord, is a lamp for my feet” (Psalm 119:105) contains a treasury of gems relating to Christ Jesus. Let us spend a bit of time, then, breaking it apart. What is this word? Saint John the Evangelist tells us that Jesus is the word of the Lord: “In the beginning was the Word, and the Word was with God, and the Word was God” (John 1:1). Not only is Jesus the Word, he is also the lamp, the light itself. He says, “I am the light of the world” (John 9:5). Moreover, Jesus is also the path upon which our feet walk, for he says, “I am the way and the truth and the life” (John 14:6). The words of the Psalmist are a great foreshadowing of Christ Jesus. Is this not a great marvel? This morning at Mass with the first, second and third graders I connected this refrain to the life of Saint Anthony of Padua. Perhaps the most common portrayal of the Evangelic Doctor depicts him holding the Christ-child in his arms. Our heavenly patron is portrayed twice in this way in our church. The story goes that he was staying in the home of a man named Tiso, who gave Anthony a room away from other people so that he might pray in solitude and quiet. Tiso, being a good host, frequently walked by the Saints room to make sure he was comfortable and all was well. One time he saw a light shining out from under the door and, on coming closer to investigate, he heard voices. Peering into the room, Tiso saw the man of God kneeling before his desk, with a book lying open upon it and upon the book was a luminous child, more beautiful than any he had ever seen, whispering into the ear of Anthony. May each of us, too, listen to and meditate upon the Divine Word. Let us bask in the beauty of his light and walk on his path. Truly the thought of the uncertainty of the morrow should produce in a soul most hearty contrition; but for us, Christians or religious, who look upon ourselves as exiles here below, and who long only for the dissolution of our body that we may enter our true country, there is, it appears to me, only joy and blessedness in the thought each moment we get nearer to th last hour of our life. Thanks to the wonders of inter-library loan, I am currently reading Charles Warren Stoddard's Father Damien: The Martyr of Molokai (San Francisco, California: Catholic Truth Society, 1901). It is a short little book (only 30 pages), but it includes several of Father Damien's letters, which are a great pleasure to read. My dear parents: I cannot hesitate to write to you on this grand Christmas Day, for the great feast has brought me to the certainty that God has called me to quit the world and embrace the religious state. Therefore, my dear parents, I ask you again for your consent; for without it I cannot venture to enter on this career. God's command to obey our parents does not apply only to childhood. Do not think that in choosing the religious state I am guided by own will; I assure you that I do but follow the will of Divine Providence. I am not afraid that you will refuse me, since it is God who calls, and I am obliged to obey his call. For you to hinder your child from following God's will, would expose yourselves to terrible consequences from His anger, and would expose me to the irreparable misfortune of losing the vocation for which God has destined me from infancy, and would put in jeopardy your eternal salvation. You know, my dear parents, that each individual is bound to conform himself to the designs of God in choosing a state of life, if he wishes to make his future happiness secure; do not, therefore, distress yourselves at God's designs for me. Augustus [his older brother] writes me that I should certainly be admitted in his Congregation as "Frere de Choeur," that I should not fail to speak to the Superior at the New Year, and should begin my novitiate a little later. Hoping for this great happiness, I sign myself, your obedient son. Joseph at the time was eighteen years of age. His words may be a bit harsh, but they are also true. Parents must not only help their children to discern God's will for their lives; they must also help and enable their children - to whatever extent possible - to respond generously to God's design for their lives. Adoro has a powerful post on what she would like to say to parents who bring their children to PSR type classes but clearly have no intent to grow in faith themselves. You really ought to read what she wants to say; I'd like to say it, too. What she wants to say is straight to the point. I wonder, if we spoke like this, would it be helpful? Would it help people understand the great importance of the faith? Would it help jar them out of their stuppor? Will someone please explain to me why I haven't begun using Google Reader (or something similar) until today? It sure saves a lot of time, and effot! A Catholic Mom in Hawaii passes along this story of concern for an increasing number of pilgrims to Kalaupapa in light of Blessed Damien of Molokai’i’s forthcoming canonization. Fr. Joel at Holy Priesthood has a clever commentary on society today. The American Papist gives us an awesome picture of the Pontifex Maximus. A Catholic Mom in Hawaii directs our attention to a PBS poll concerning Governor Sarah Palin. The Crescat provides us with photos of Saint Pio of Pietrelcina, a.k.a., Padre Pio. Over at Unam Sanctam, Andrew skillfully answers a “non-denominational” Protestant. This evening I went to our mission parish to resume my Bible studies that are quite popular there. I was hoping to wait until after the harvest, but the farmers aren't quite sure when that will be; some of them may be out already, and others might not be out for a while. Tonight we had 20-25 people present (out of 250). This being the Year of Saint Paul I knew that I wanted to focus on Saint Paul for a bit. I wasn't quite sure, though, how I wanted to go about it, until I found a book by Fr. Mitch Pacwa, S.J. : Saint Paul: A Bible Study for Catholics. In this book written for this Jubilee Year, Fr. Pacwa examines Saint Paul's teachings on the Sacraments, with the exception of the Anointing of the Sacrament (the Apostle doesn't have much to say about it). After a quick perusal of the book I decided it would be perfect to help prepare six Bible studies going through Saint Paul's teaching on the Sacraments. 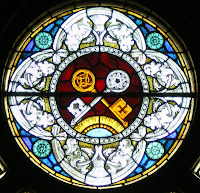 This would serve the double purpuse of focusing on the Apostle during his year and of reflecting more on the Sacraments. I think it went well this first night. Those who came kindly gave pemission to record my presentation on my new digital voice recorder. The quality is good, but now I have to find a way to get it from the recorder onto my computer. I apparently don't yet have all of the necessary cables. I'll try to remedy that in the morning. If I can figure out how to do it, I will post this evening's Bible study as a podcast. We all receive them from time to time, those catalogues that we do not request but quietly look forward to finding in our mailbox. Today I found one such cataglogue from Acorn. Flipping through the pages one item especially caught my eye: Remote Control Jousting Knights. How wouldn't have fun with these! The crowd grows silent. Hooves thunder. And you, brave knight that you are, knock your opponent to the ground. Huzzah! Revisit the days of yore and get all medieval with this fun action toy. Each knight-on-horse is 7" long, 6" high. Comes with two jousting staves and two remote controls. Set requires 8 AA batteries (not included). Ages 8 and up. 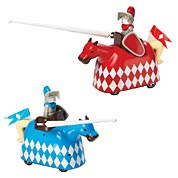 The remote control jousting knights would certainly be magnificant entertainment on those days when I'm feeling particularly goofy - which might increase if I had a pair - but what of those days I'm in the mood for something a bit more...intellectual? For these days, this looks appealing: Solitaire with Semiprecious Marbles. Legend says that th game of solitaire was created by a nobleman confined to the Bastille prison during the French Revolution. The goal is to eliminate all but one marble. 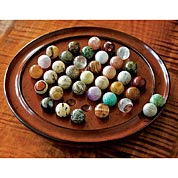 This beautifully crafted game features a hardwood gameboard and hand-cut, hand-polished semiprecious stone marbles - agate, columbite, green jasper, rhodonite, and a variety of other stones. Set of 38 includes two spares. Marbles will vary from set to set; board is 9 1/2" diameter. I've stayed at a friary in a northern state a few times that has this very game. I've been known to sit there for more than an hour at a time playing the game. I love it! Do you have a favorite catalogue like this one? Last Friday morning one of the ladies who works here in the office was eating a chocolate chip cookie bar that she brought from home. I said to her, quite truthfully, "I haven't had one of those in years!" Saturday evening this same family brought the gifts forward at Mass. As I received the gifts from the two boys, I asked them if the cookies were good. Oops. Apparently I made one of them a bit nervous that they hadn't given me any of the bars. On their way back to their pew, he told Mom they had to make a batch for me Sunday night to give to me Monday morning. I'm happy to say they did just that. When I walked into my office this morning I found a big zip lock bag of chocolate chip cookie bars, a whole pan's worth of them! There was a note, too, that said one of the boys said I have to share them with the Pastor and with his dog. I'm not so sure about sharing them with Molly, though. The other boy apparently asked Mom if she thought I knew how to dip the cookies in milk, because they are really good that way. She told him that I was a boy once, too, and she was sure I knew about dipping cookies in milk. She's right, of course. It's been a busy weekend, but a good one. Friday and Saturday the junior varsity soccer team played in a tournament in a Highland, a little more than an hour away. They lost their game Friday night 5-0, won their game Saturday morning 2-1, and lost their game Saturday afternoon 2-0. We drove to Highland and back on Friday and again on Saturday, which provided two very entertaining car trips with the players. Lots of laughter was had, and even a bit of serious conversation. After the second game on Saturday I hopped back in my and returned to Effingham with a little time to spare before the evening Mass. When we returned from the game on Friday I popped out to the high school to show up - just briefly - for the "neon dance." I hated dances in high school, and my dislike of them hasn't changed. I've never been one for crowds, dark rooms and loud music. That, and I'm not one to dance anyway. I've spent a good part of this afternoon learning more about podcasting. If all goes well, I'll be ready to begin by the end of the month. I'd like to start podcasting on the Feast of St. Francis, but I'll be in Quincy on a Great River Teens Encounter Christ retreat. Still, I suppose I could publish the podcast before the weekend starts... We'll see what happens. In the morning I'll be interviewed again on WCRA radio, AM 1090 and FM 104.7. I believe the topic will be Pope Benedict XVI's address to the representatives of the French world of culture. At 7:00 p.m., I'll be resuming my Bible studies at our mission parish discussing Saint Paul and Baptism. It's looking as though it will be a busy week, but's alright. Today our common perception of the world is challenged. The prophet Isaiah tells us that God does not think as we do (Isaiah 55:8); Saint Paul tells us that death is life (Philippians 1:21); and Jesus tells us not to look at what others have (cf. Matthew 20:15). Taking these three together it is clear that we must change the way we see the world. Looking out onto the world, what do you see? Where is your focus? To what is your gaze and attention drawn? There are many today who live each day thinking only of this life and of what they can get out of it. Life is for the taking, they say, yet the more they grab the more they want and the unhappier they become. Do we not all do this, at least from time to time? Do we not keep our eye fixed on the things of this world, forgetful that this life prepares us for the next? It is this view of the world – our constant focus on this life – that we must change. To our thinking the parable of the workers in the vineyard is unjust. It is not fair to pay people equal wages for unequal work, we say. And yet this is precisely what Jesus says happens. What is he trying to tell us here? If the purpose of this parable is to show us that the Lord gives equally to all, if it is one meant for encouragement, why do we find it so disconcerting? If the Lord were simply handing out money in the parable what he does may well be unjust, even though all of the workers did agree to the same wage. But the One who tells this parable is the same One who tells his disciples to “carry no money bag,” so we know that he cannot here be referring to money (Luke 10:4). What, then, is this “usual daily wage,” this denarius, that the Lord gives us? It is “neither silver nor gold,” (Acts 3:6) but the gift of the Spirit that perfects us and leads us to eternal life. The Lord calls all people to receive this grace of the Spirit at the same time, but we answer at different times because of the choices we make and the way in which we see the world. In Greek, Jesus asks,”h o ojqalmoV sou ponhroV oti egw agaqoV eimi” (Matthew 20:15)? “Is your eye wicked because I am good?” What does he mean? Why did those laborers in the vineyard grow envious of those hired after them? It was because of their wicked eyes. They were not content with what the Lord gave them and thought themselves better and more deserving than those hired after them. Their jealousy turned their eye to wicked glances. My brothers and sisters, is any of us more deserving of the Lord’s grace than another? Of course not! “Indeed, we must all rejoice exceedingly to be even the last in the kingdom of God,” because none of us deserves Paradise! The fact that we often grow upset when we consider that those who convert on their deathbed receive the same grace as us is a sign that our love is not yet sincere, that we do not yet appreciate the Lord’s mercy toward us. If we did, we would desire that mercy to be shared with every person. The challenge before us today, the question the Gospel poses to us, is this: “whether the first ones, who were righteous and pleased God and who shone brightly from their labors through the whole day, at the end are possessed by the lowest vice, envy and jealousy.” Notice that envy and jealousy can bring our good works to nothing. Our eye grows wicked through envy and jealousy as we look to what others have been given and when we consider ourselves more deserving than they. This is what Jesus means when he asks, “Is your eye wicked because I am good?” Are we jealous because “the Lord is gracious and merciful, slow to anger and of great kindness” (Psalm 145:8)? Are we envious because “the Lord is good to all and compassionate toward all his works” (Psalm 145:9)? Do we look around, envious of his generosity? If we do, it is because we see the world improperly. And I do not know which I shall choose. I am caught between the two. I long to depart this life and be with Christ, for that is far better. Yet that I remain in the flesh is more necessary for your benefit (Philippians 1:22-24). Paul goes on to say, “Convinced of this, I know that I shall remain and continue with you all, for your progress and joy in the faith” (Philippians 1:25). The Apostle knows the Lord has given him a work to do and because he does this work he says, “Christ will be magnified in body, whether by life or by death” (Philippians 1:20). Would that each of us could say these words! Paul knows his task and he sets to it as the “good and faithful servant” (Matthew 25:23). The Lord Jesus has indeed given each of us a task to do, a work to undertake, whether it be as a husband or wife, a mother or father, a child, a student or priest or professed religious. We are all workers in the Lord’s vineyard, though some of us perform our work better than others. Pope Saint Gregory the Great reminds us, “All voices shout, ‘Christ,’ but not everyone’s life shouts it. Many follow God with their voices but flee from him with their conduct.” More than our voices, our very lives must shout Christ so that he will be magnified in us. Do you want to be happy? Then follow the example of Saint Paul and live not for your own sake but for the sake of Christ. Do you want to be free? Then follow the example of Saint Paul who lived not as his own master but as a servant of the Lord. If we look at life with a wicked and jealous eye, the example of Paul seems ridiculous. But if we stop, even for a moment, and look at Paul with a good eye we know that he lived rightly. At the end of each day, let each of us echo the words of that servant in another parable: “We are unprofitable servants; we have done what we were obliged to do” (Luke 17:10). Amen. Saint Gregory the Great, Forty Gospel Homilies, 19.4. In ibid., 111. Saint John Chrysostom, The Gospel of Matthew, Homily 64.3. In ibid., 111. Saint Gregory the Great, Forty Gospel Homilies 19.5. In ibid., 112. Incomplete Work on Matthew, Homily 34. In ibid., 108. Saint Ambrose, On Abraham 2.5.22. In ibid., 218. Capello tip to Joey at Catholic Homeschooled Teens. You scored 13% Cardinal, 72% Monk, 53% Lady, and 43% Knight! Catholic Charities is begging for supplies for the food pantry, particularly staple food items such as canned fruits and vegetables, pasta and sauces and cereals. Please be as generous as you can. Items can be dropped off at Catholic Charities between 8:30 a.m. and 4:30 p.m. Monday through Friday or brought to the parish and we will see them delivered. Also, don't forget our monthly food pantry collection the last weekend of each month at the church. Those of you outside the Effingham area might also consider making a donation to your local food pantry. ...kind of. You might have noticed I've been away the past few days. If so, you noticed rightly. Tuesday afternoon the priests of the Diocese gathered with Bishop Lucas for the annual Clergy Convocation. I had hoped to post from the Convocation but Internet access was very limited. It was the first convocation of my priesthood that I have enjoyed fully. The only enjoyable part of the past three convocations was being with my brother priests; this year I had that joy and the joy of being spiritually and intellectually stimulated. It was so nice to hear, "Do you know this book? You should read..." I love academia. Fr. Robert Barron, a priest of the Archdiocese of Chicago and of Word on Fire fame (and a professor of mine in the seminary) spoke to us of the three-fold ministry of the priest as one who sanctifies, teachers and governs. To do so he focused on the images of Christ as priest, prophet and king. As Fr. Barron always does, he combined his vast learning and his easy humor to teach us and inspire us; I am very glad he came. I was only able to be present for his reflections on the images of prophet and priest because I had to return to the parish a day early for a funeral celebrated this morning. I'll post more once I've caught up on a few things. On the Memorial of Saint Francis of Assisi, October 4th, His Excellency the Most Rev. George J. Lucas will celebrate a Mass for Life at Holy Family church in Granite City, Illinois at 9:00 a.m. Following the Mass, Bishop Lucas will lead a prayerful rosary walk to the abortion clinic. A light luncheon and presentation by a speaker from Gospel of Life Ministries will follow the walk. If you are able, please plan to attend. A Catholic Mom in Hawaii passes on the happy news that Bishop Larry Silva has designated eleven churches in the island chain in which one might obtain the indulgence granted by Pope Benedict XVI during the Year of Saint Paul. Over at Adam’s Ale, Fr. V. offers a suggestion on what to do when the homily is dreadfully boring. The American Papist answers Time magazine’s question, “Does Biden have a Catholic Problem?” in the affirmative. Pope Benedict XVI's address to the University of Regensburg launched a new and fervent dialogue between Christians and Muslims on the relationship between faith and reason. I cannot help but wonder if his address at the College of the Bernardines in Paris will launch a renewed dialogue on the relationship between faith and culture and society. Beginning with a consideration of the formation of Christian monasteries, the Pontiff touches upon the quest of monks, Divine Revelation, the interpretation of the Bible, music, liturgy, apologetics, freedom, work and evangelization. And, as always, the Holy Father teaches in a clear and linear fashion. The word does not lead to a purely individual path of mystical immersion, but to the pilgrim fellowship of faith. And so this word must not only be pondered, but also correctly read. The God who speaks in the Bible teaches us how to speak with him ourselves. Particularly in the book of Psalms, he gives us the words with which we can address him, with which we can bring our life, with all its highpoints and lowpoints, into conversation with him, so that life itself thereby becomes a movement towards him. Christian worship is therefore an invitation to sing with the angels, and thus to lead the word to its highest destination. [I]n communal prayer one is singing in the presence of the entire heavenly court, and is thereby measured according to the very highest standards: that one is praying and singing in such a way as to harmonize with the music of the noble spirits who were considered the originators of the harmony of the cosmos, the music of the spheres. [T]he word of God only comes to us through the human word and through human words, that God only speaks to us through the humanity of human agents, through their words and their history. This means again that the divine element in the word and in the words is not self-evident. To say this in a modern way: the unity of the biblical books and the divine character of their words cannot be grasped by purely historical methods. It would be a disaster if today’s European culture could only conceive freedom as absence of obligation, which would inevitably play into the hands of fanaticism and arbitrariness. Absence of obligation and arbitrariness do not signify freedom, but its destruction. It really is a magnificent address. On this very day in the year of our Lord 1224, when he spent time in a hermitage on Mount La Verna, Saint Francis of Assisi received the sacred stigmata. Although this servant and friend of the Most High found himself adorned with these pearls, like most precious gems, and was more wonderfully rich in honor and glory than any other man, he nevertheless did not become haughty about it deep within himself and never attempted to boast about it with anyone out of the desire for vainglory. Instead, in order to prevent the favor of men from stealing heavenly grace from him, he tried to hide it in every way possible (First Life, 94-95). So very often we consider sadness and happiness and joy and sorrow as complete opposites, in such a way that one cannot be in the presence of the other. Francis was, of course, filled with sorrow at the Passion of our Lord and filled with joy at having seen the Lord in his glory upon the Cross; it is possible to experience both at the same time and it is good to do so. It is only right that joy and sorrow, sadness and happiness, mark our lives, for with these seemingly contradictory emotions and characteristics are present within us we imitate the Poverello, and in imitating him we imitate the Lord himself. My own life is marked with much sadness and yet much happiness, as well. The deaths of my parents, in particular, stand out as the saddest days of my life and have, quite naturally shaped my outlook on the world. And yet, it was through their deaths that I came to experience the joy of suffering with Christ. I am, as it were, a man of joy and sorrow. It was through their deaths – and through other events of my life as well – the Lord offered his Cross to me. It is not easy to embrace the Cross, but there is also something very intriguing and inviting about it, almost even compelling. The Cross beckons to us and the more we attempt to resist its call, the more intently we hear this call. The more we run from the Cross the greater our sadness becomes, but if we embrace the Cross our sadness is accompanied by much happiness and joy. It is because my life has been marked with such sadness, I think, that smiling does not come naturally to me. As I walk down the sidewalk or go shopping or what not, I only rarely have a smile on my face; most commonly I am straight-faced, and many – for one reason or another – interpret this as my being sad, when I am in reality quite content. The sorrows of my life daily accompany me; so, too, do the joys of my life. The sadness and joy of the Cross is always present. For this reason, when I do smile it is a genuine smile and, I am told, it brightens a room. Perhaps it does; if it does, it is because it is authentic and sincere. But let us return now to Saint Francis. If we look at what is said to be the most authentic and true life image of Saint Francis that we have, his face is one marked by sadness and happiness. Though he bears no smile, a smile is forming, as it were, in his eyes. Let each of us, then, approach the Cross of Lord in humility of heart, that we, with Saint Francis, might be marked the sorrow and joy of the Cross. If you don't laugh at this, you must be near death. Oh, and don't forget to vote in my little poll. One vote per person, please. Yesterday evening the soccer team gathered for another "pasta night." At these evenings, some of the boys' parents team up and provide pasta, salad and drinks for the boys. The pasta nights are great fun and I think everyone looks forward to them; we try to have one each week during the season. Last night most of the boys gathered in the basement of the house where there was a Play Station 3. Hearing the noise from the game and having played video games for most of my life (I got my first job because I played video games) I went downstairs to see what they were playing. As I rounded a corner I thought I heard the whurr (sp?) of a lightsaber, and I did. The controller was soon passed to me and I did decently well, considering it was my first time at this game, whose title I don't recall, and that I hadn't played a video game with a controller in quite a long time. In this game you can use the force to knock enemies away from you, which was most popular with the boys. They kept yelling, "Use the force!" But I preferred to use my lightsaber, which caused more damage and killed the enemies faster; it seemed logical enough to me. But there is a trick, apparently, to using the weapon of the Jedi. I chased a trooper to the edge of a platform that had no railing and, as I swung my lightsaber to deliver the final blow, both he and I fell to our doom. I guess I forgot to back up a step before making that last stroke. Back in college, my roommate and good friend - the one who unexpectedly popped in for a visit some time ago - and I played video games together and one of our favorites was a Star Wars game. Playing the game last night brought back many enjoyable and happy memories. In any event, my demise was of great amusement to the boys and I suspect I'll hear about it again at some point. I had a blast down there and I stayed for a bit before returning to the parish for a meeting. At one point some of the boys asked if I played video games and were surprised to learn that I still have a Play Station (the original) and enjoy games a lot. I don't, however, have it hooked up because video games can be rather addicting. But after playing yesterday I'm very tempted to hook the old system up again. On this most solemn of days, dear brothers and sisters, we have come to rejoice in a piece of wood; we exult in that wood on which hung the Savior of the world. What is the cross if not the scale that weighed the price of our salvation? The sins of us all were weighed against the life of Christ. Our life came at a very great price, indeed! This cross, the greatest scale of all, fully satisfied the bond of our damnation and released us from our ancient debt incurred through sin. The cross is, as it were, that great lever that lifted the world and restored it to harmony with the Creator. Under the standard of the cross we find protection from evil, though it does yet realize that Christ has won the victory once for all! While we sat in darkness, the cross transformed us into children of light (cf. Matthew 4:16 and Ephesians 5:8); while we were enemies, it made us members of the household of God; and when we were slaves the cross made us children of God the Father. It was through wood – through the tree of the knowledge of good and evil – that the prince of pride subjected us to the slavery of sin (cf. Genesis 3:1-24), and it was through wood – the wood of the cross – that the Author of Humility received as his children and as his heirs of grace. Through wood, the Devil subjected us to exile, and through wood the Most High King declared us heirs to his kingdom. Through wood we were reduced to feeding swine and wanting slop, and through wood we were received into our Father’s embrace (cf. Luke 15:12-32). In short, it was through a piece of wood that we lost friendship with the Lord – the tree of knowledge through which the serpent deceived our first parents, deceiving them into thinking that they, too, in their pride, could be like God. It was a piece of wood that put us in opposition with our Creator and so it is fitting that another piece of wood should bring us salvation. It was on a piece of wood that Moses lifted up the serpent of bronze when the Lord commanded the people to look upon it and be healed (cf. Numbers 21:4-9). In doing so, Moses gave us a sign to remember when the one true cross would come; it is a sign that the Lord has promised never to abandon us to ourselves. You must remember, dear brothers and sisters, that on the Day of Judgment each of us must stand before the Lord to give an account of our lives. The holy cross will be carried solemnly in the arms of angels and placed before all of humanity. It will not be adorned with jewels or gold, for what could be more honorable, more precious, than the Blood of the Lamb? God himself will make this cross, this wood, shine more brightly than all of the stars of heaven. The cross will be the new scales of justice on which we will be weighed and be found either lacking or accepted. The measure against which we will be weighed is none other than the measure of Christ’s own cross: how much have you loved (cf. John 13:34)? You can be sure of this, that those who lovingly embraced the cross throughout their lives will receive their glory. You can be sure of this, as well, that those who refused to take up the cross will know only disgrace. The cross is a footpath to those of us just beginning on the journey of faith, a highway for those of us fighting the good fight, and a secure resting place for those who have been good and faithful servants. For the cross of Christ is the way. “Whoever wishes to come after must deny himself, take up his cross, and follow me,” says the Lord. “For whoever wishes to save his life will lose it, but whoever loses his life for my sake and that of the gospel will save it” (Mark 8:34-35). To the world the cross looks like hardship and pain, but to those of us who believe, it is a fortress against the night and an oasis against the heat. The cross bears momentary death only to reward us with eternal life. It robs us of earthly things only to compensate us with things from heaven itself. It instructs us in humility in order that we too might be exalted like the Lord our Savior. All of the world’s wisdom has stood in opposition to the cross, and yet here we are. All of the world’s wisdom sees the cross as a sign of defeat and failure, and yet here are. All of the world’s wisdom tells us that the cross is not the way, that we must be strong and independent, and yet here we are, bending down, as it were, to kiss the holy cross. Do not think, my brothers and sisters, that the world can be right. If you believe that acceptance of the cross or the practice of humility is a sign of weakness and failure, then you do not know the truth. For only cowards rely on brute strength, and only weaklings prey on the vulnerable. The cross is the very fulcrum which has turned the world upside down – where once there was evil sitting on the throne, now there is love. That is what we come here to remember. For we preach Christ crucified, to the Jews a scandal and to Gentiles foolishness but God’s foolishness is wiser than any human wisdom, and God’s weakness is stronger than any human strength and so, for us who believe, Jews and Gentiles alike, the cross of Christ is nothing less than the power, the wisdom and the glory of God. O blessed cross, O holy cross, more valuable are you than all the gold of the world, more brilliant are you than any jewels of the earth, for it is through you that we have indeed been saved. May we be found worthy to carry you with our Savior, and be raised with him to heavenly glory. Amen! Adapted from the homily of St. Peter Damian on the occasion of the Solemnity of the Exaltation of the Holy Cross and of a homily of the Rev. Michael Fuller, adapted from the same homily of St. Peter Damian. Both in C. Colt Anderson, Christian Eloquence: Contemporary Doctrinal Preaching (Chicago, Illinois: Hillenbrand Books, 2005), 108-125 and 226-228. Entrance antiphon of the day. Today I learned on an excellent new web site sponsored by the Knights of Columbus: Fathers for Good. Do take a look at it and pass it along to the men in your lives who are fathers or who hope to be fathers. which cover the earth of our minds. to the light of unending glory. that he might be born of you. To him be honor and glory for ever and ever. Grassroots Films has done it again! When the Bulldogs played the Indians the other day they should have one the game, but they tied. Part of the reason was because after they scored their goal, the Bulldogs let up the pressure and didn't play with the same intensity. The Indians, seeing this, then managed to score three goals rather quickly, thus tieing up the game. At the beginning of practice yesterday the coach mentioned this and told the boys to keep up their intensity. At the end of practice it was my turn. I asked the boys, "Do you remember the battle between Moses and King Amalek?" It was answered with quite a few blank stares and no small amount of grumbling. It was, of course, the battle that "whenever Moses held up his hand, Israel prevailed; and whenever he lowered his hand, Amalek prevailed" (Exodus 17:11). I connected it to Moses keeping up his intensity and letting up. I think the message went through. Now they might hear me yell from the bench, "Keep your arms up!" Given that arms aren't used in soccer this might confuse the other team, but hopefully our boys will remember what it means. Within the hour we play the Effingham High School Hearts. If we keep the intensity, we should win, given that the game isn't on account of the weather. Today I wore a The Legend of Zelda (the original Nintendo Entertainment Systemt one) t-shirt with Link on it to soccer practice. It prompted a bit of a debate as to which video game is the best, The Legend of Zelda or Super Mario bros.
Would you be so kind as to offer your vote in the poll on the right. I'll keep the poll up through Sunday and give the results to the boys on Monday before our game. Thanks! It was suggested in the comments that not enough people have yet read the statements of the United States Conference of Catholic Bishops regarding the recent scandal of the comments made by certain Catholic politicians. I agree, so I am happy to give you, in full and unedited, the two recent statements of the Bishops. More information on the Church's teaching on this issue can be found in our brochure "The Catholic Church is a Pro-Life Church". Recently we had a duty to clarify the Catholic Church’s constant teaching against abortion, to correct misrepresentations of that teaching by House Speaker Nancy Pelosi on “Meet the Press” (see www.usccb.org/prolife/whatsnew.shtml). On September 7, again on “Meet the Press,” Senator Joseph Biden made some statements about that teaching that also deserve a response. The first is a biological question: When does a new human life begin? When is there a new living organism of the human species, distinct from mother and father and ready to develop and mature if given a nurturing environment? While ancient thinkers had little verifiable knowledge to help them answer this question, today embryology textbooks confirm that a new human life begins at conception (see www.usccb.org/prolife/issues/bioethic/fact298.shtml). The Catholic Church does not teach this as a matter of faith; it acknowledges it as a matter of objective fact. The Catechism of the Catholic Church states: “Since the first century the Church has affirmed the moral evil of every procured abortion. This teaching has not changed and remains unchangeable. Direct abortion, that is to say, abortion willed either as an end or a means, is gravely contrary to the moral law” (No. 2271). From earliest times, Christians sharply distinguished themselves from surrounding pagan cultures by rejecting abortion and infanticide. The earliest widely used documents of Christian teaching and practice after the New Testament in the 1st and 2nd centuries, the Didache (Teaching of the Twelve Apostles) and Letter of Barnabas, condemned both practices, as did early regional and particular Church councils. To be sure, knowledge of human embryology was very limited until recent times. Many Christian thinkers accepted the biological theories of their time, based on the writings of Aristotle (4th century BC) and other philosophers. Aristotle assumed a process was needed over time to turn the matter from a woman’s womb into a being that could receive a specifically human form or soul. The active formative power for this process was thought to come entirely from the man – the existence of the human ovum (egg), like so much of basic biology, was unknown. However, such mistaken biological theories never changed the Church’s common conviction that abortion is gravely wrong at every stage. At the very least, early abortion was seen as attacking a being with a human destiny, being prepared by God to receive an immortal soul (cf. Jeremiah 1:5: “Before I formed you in the womb, I knew you”). In the 5th century AD this rejection of abortion at every stage was affirmed by the great bishop-theologian St. Augustine. He knew of theories about the human soul not being present until some weeks into pregnancy. Because he used the Greek Septuagint translation of the Old Testament, he also thought the ancient Israelites had imposed a more severe penalty for accidentally causing a miscarriage if the fetus was “fully formed” (Exodus 21: 22-23), language not found in any known Hebrew version of this passage. But he also held that human knowledge of biology was very limited, and he wisely warned against misusing such theories to risk committing homicide. He added that God has the power to make up all human deficiencies or lack of development in the Resurrection, so we cannot assume that the earliest aborted children will be excluded from enjoying eternal life with God. In the 13th century, St. Thomas Aquinas made extensive use of Aristotle’s thought, including his theory that the rational human soul is not present in the first few weeks of pregnancy. But he also rejected abortion as gravely wrong at every stage, observing that it is a sin “against nature” to reject God’s gift of a new life. In 1827, with the discovery of the human ovum, the mistaken biology of Aristotle was discredited. Scientists increasingly understood that the union of sperm and egg at conception produces a new living being that is distinct from both mother and father. Modern genetics demonstrated that this individual is, at the outset, distinctively human, with the inherent and active potential to mature into a human fetus, infant, child and adult. From 1869 onward the obsolete distinction between the “ensouled” and “unensouled” fetus was permanently removed from canon law on abortion. Secular laws against abortion were being reformed at the same time and in the same way, based on secular medical experts’ realization that “no other doctrine appears to be consonant with reason or physiology but that which admits the embryo to possess vitality from the very moment of conception” (American Medical Association, Report on Criminal Abortion, 1871). Given the scientific fact that a human life begins at conception, the only moral norm needed to understand the Church’s opposition to abortion is the principle that each and every human life has inherent dignity, and thus must be treated with the respect due to a human person. This is the foundation for the Church’s social doctrine, including its teachings on war, the use of capital punishment, euthanasia, health care, poverty and immigration. Conversely, to claim that some live human beings do not deserve respect or should not be treated as “persons” (based on changeable factors such as age, condition, location, or lack of mental or physical abilities) is to deny the very idea of inherent human rights. Such a claim undermines respect for the lives of many vulnerable people before and after birth. The illustrious Fr. Z. has an interesting post on Senator Obama's proposed "civilian national security force." I've said to a number of friends that Obama's rise to influence too closely resembles the rise of several historical personages, the rise of whom has not been a boon to the majority of their people. Though I was previously unaware of his idea for civilian national secuirty force, this only confirms my suspicions. This afternoon the St. Anthony Bulldog soccer team played a match against the Carlyle Indians, at Carlyle. The County fairgrounds saw one more dog fight this Tuesday evening, as the St. Anthony Bulldogs and Carlyle Indians varsity soccer teams viciously battled to a tie. With seventeen and nine shots on goal respectively, the two teams played a fairly balanced game. Each team did seem to dominate their fair share, though. The Bulldogs succeeded on three of those seventeen shots, two of which were scored in the second half. The first half was held by the Bulldogs as they took the lead in about the middle of the half, as Riley Westendorf managed to put the ball in the back of the net unassisted. Carlyle failed to score in the first half. The second half succeeded in mixing up the action. Five of the six goals were scored, and the Indians showed some reignited flames. Michael Kabbes blasted a ball into the goal off of a pass from Evan Hakman. Brett Haarmann followed that success with his own goal prompted by a corner kick taken by Charles McGuire. After these two goals, the Bulldogs took the largest lead they’ve had for the season. St. Anthony’s varsity goalkeeper, Cody Sandschaefer, allowed three goals from the opposing team, all of which were in the second half. The third and final goal, which brought the tally to a tie, was scored off of a penalty kick called on Craig Brummer in the far corner of the box. The call raised some eyebrows, and some voices, but the team played on. Emotions ran high as the game came to an end, and the final whistle caused some despair. Coach Shane Nelson commented on the outcome of the game. “We played well as a team. It’s nice to see a young team put forth such effort game after game. We had more shots on goals than any other game, and more goals than the rest of our season combined.” Ten of Carlyle’s fourteen team members were first-year players. The paper has not published the first two articles he wrote (which he hasn't posted on his blog); we'll see if they publish this one, or at the very least offer him tips to have future articles published.